In a series of bite-sized videos, you will follow along step-by-step with Chris and do exactly as he does. This isn’t lecture style teaching. It’s lab class, and you’re going to get your hands dirty. I wanted to give Chris Farrell’s Membership a thorough review so I followed along through every video, every step, and did exactly as Chris instructed. I don’t think he could have made it more simple. He even includes an optional video along the way that teaches the basics of computer use… how to copy & paste for example. But I don’t want to get too far ahead of myself here. I’ll come back to the training in a moment. Will CFM Help Me Reach My Goals? 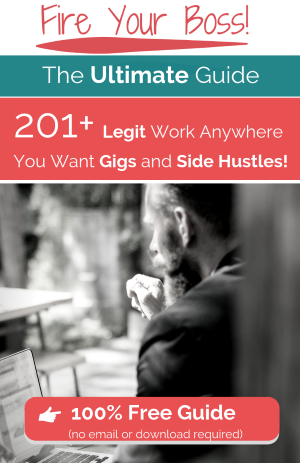 That depends on where you are in your online career, and what your goals are. If you’re a beginner or relatively new to affiliate marketing, then yes it will, but only up to a point. As I went through the training I was trying to imagine it as someone new to affiliate marketing and the mechanics of setting up a website. This is where I’m a little torn. It might be too easy. The reason I say too easy, is because he makes it so simple that in doing so, he skips over some of the “heavy lifting” that is involved in the process. I understand why he does this. As mentioned, it wasn’t easy for him when he started out. Therefore, he really wants to take away that confusion and frustration for others, and give them a fighting chance. He does this by not overwhelming them in the beginning, and I can’t argue with his approach. The challenge for me as I followed along, was being aware of the details he was skipping over. It’s those details that will ultimately get you bogged down and frustrated later on. Which is why he skipped over them. In this way, a beginner can get a complete picture of how all the pieces fit together from beginning to end. They won’t get overwhelmed early on with things like research, content creation, lead magnets and the mechanics inside of WordPress. Ultimately I think he made the right decision going in this direction. However, his approach leaves me a little conflicted. 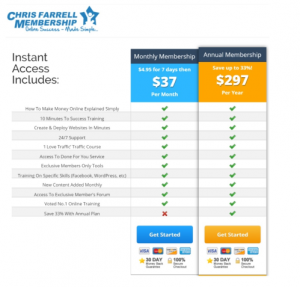 Chris Farrell Membership teaches affiliate marketing through sales funnels. This is the process of building an email list and periodically sending your subscriber’s affiliate offers (in addition to valuable content). While sales funnels can be critical to getting the most from your online business, they can also oversimplify the process. Beginners might get a false impression early on that this entire online marketing thing is a piece of cake. But later, when they’re knee deep in learning how to generate traffic for example or to convert that traffic into customers, they might find that they’re up against a larger mountain than they initially thought. It’s a mountain worth climbing. But if you want to avoid some of the potential disappointment (success won’t happen overnight), it’s good to know what lies ahead. Now, I also need to be clear. Chris Farrell Membership doesn’t stop at the easy stuff. There is more advanced training for those who stick it out. But… the reason I say CFM will only help you reach your goals up to a certain point, is because some of the more advanced stuff is really just introductory training. It gets you started in the right direction, but you’ll be searching online for addition resources as you go further. I don’t want to discourage anyone from trying out Chris’ program because there’s so much stuff that’s really good. And Chris is a great teacher. But it’s not the complete program I had hoped for. Is Chris Farrell Membership a Multi-Level-Marketing Scheme? If you’re just skimming over this article quickly and briefly touching the main points (I don’t blame you, it’s a long read)… I’ll just mention again that Chris’ Membership is a program that teaches affiliate marketing. So, it’s not a scam, and it’s not an MLM. But, inevitably the question comes up, so I like to go over it anyway. You may have read a comment like, “I hear only people at the top make money”. To answer that, there is no “top”. There are people who are further along in their online journey, and they are making money… some earning high 5-figures and even 6-figures every month. And, some individuals aren’t making any money. But there is no pyramid of money flowing to the top. Each Affiliate Marketer is building, managing and promoting their own business… their own brand, independently. You don’t bring someone in, and sponsor them, and help them bring other people in and so on. You can certainly earn affiliate commissions by recommending a program. But, that program could be anything… from learning to play guitar to guided meditation. You can also recommend physical products, such as those found on Amazon. Also, as an affiliate marketer, you may discover that there’s a camaraderie and genuine desire to help one another achieve success inside the industry. It’s competitive as well, and there’s some secrecy around specific “niches” as no one really wants to share their sites for fear of being copied (or bringing in competitors to a profitable industry), but they are more than willing to help out. Personally speaking, I think it’s because a lot of people who pursue this lifestyle do so because they’re frustrated and fed up with the rat-race. They’re taking back control of their own lives, and they also understand that there’s more to life than spending your days doing something you really don’t like. The money can be good, but it’s things like TIME, freedom, and mobility that most of us are really chasing. And, because we understand that frustration so deeply, it’s really easy to empathize with others going through the same thing. In fact, those who stick it out in this business share that common understanding more than anything else. So… What Is Affiliate Marketing? For those of us who do this all of the time, it’s easy to forget that most people don’t really understand what affiliate marketing is, or how money can be made online. I’ll give my quick-minute explanation. Have you ever gone out to a really great restaurant? You were so “wowed” by the food, so impressed by the service, that you just had to tell a friend about it? Now, what if your friend went out to that restaurant based on your recommendation… and the restaurant owner gave you a little “kickback”… a commission, because you recommended their food and service to your friend? That’s a simple explanation of what affiliate marketing boils down to. It’s the online equivalent of “word of mouth”, and there are hundreds of thousands of companies that want to pay you for your recommendation. There is no additional cost to the person purchasing. That commission is paid by the product creator as part of their advertising… or marketing budget. It’s not unlike your real estate agent offering you a dinner or a gift when you refer a friend. What Do I Get With Chris Farrell Membership? It starts with Chris showing you exactly how to get a web business set-up and configured for earning money. As I’ve mentioned earlier, this is some of the best “getting started” training I’ve seen. There’s also a members forum, support staff, and a few extra goodies. The first “goodie” that I really liked is Chris’ Online Journal documenting his first 11 months online. I highly recommend you read it if you become a member. The second (and really impressive for the price) is a “Done For You” section. Here you will find turn-key “engines” in 6 different niches. For your part, you’ll have to purchase a domain and hosting, as well as choose an affiliate product to promote. And… you will need to get your own audience. These packages are a little dated. They’re not irrelevant (they are still profitable niches) but the graphics, fonts etc. are definitely from a different era. Ultimately that’s not the point though. You wouldn’t build your entire online career using these pre-made websites, but what a great way to get started. You can learn how everything comes together, and make your mistakes without risking your own content… which can take months to create. You may even learn some of the harder lessons, such as the potential cost of paid traffic if you’re not taking a surgical approach to audience targeting and conversion optimization. Chris provides you with everything you need as far your website pages, your free “gift” (to entice readers to subscribe), and your pre-written emails in which you will promote products. It might not be as extensive as some similar “Done For You” packages, but those packages can typically cost a $1000 or more. And here at Chris Farrell Membership, you have access to these for $37/month. But I must emphasize, if you want to take your online career further than this… you will eventually have to tackle the tougher stuff. And CFM doesn’t always remind you of this. Chris’ program also begins to run out of steam in the more advanced training modules. The specific method of affiliate marketing that is taught at Chris Farrell Membership is to drive traffic through a sales funnel. This is done through a single page which leads to an “opt-in” form. This form captures a person’s email, and then instead of writing content that you’d normally find on a website (like this one), that content is sent directly to the person’s email. You’ve probably signed up to someone’s list before and know what I mean. There is nothing “spammy” about this method of marketing IF the content you provide is valuable to your readers. If you’re just going to blast people’s mailboxes with product offers then yes, it’s spam. But, I subscribe to many email lists because the content those people are providing is both relevant to what I’m interested in, and it provides true value. If they have a product to promote, I may or may not be interested… but they’ve built trust with me and I know that the products they recommend are relevant (and of good quality). If someone just sends me endless product links every day, they’re off my list. Possibly the easiest and most efficient “get-started” tutorial out there. Done for you packages included with membership. Easy Cancelation procedure (CFM does not try to trap you in). Chris teaches you himself (no paid actors reading scripts). Training includes some basic computer skills for people who need it. Training loses a little momentum in the advanced stages, and will have you looking for more. No starter membership or free trial offered. Additional costs (You will need a web hosting account, and an email autoresponder. Also, training that focuses ONLY on sales funnels inevitably leads to paid advertising to obtain traffic). I usually have something to add here, but there’s nothing really that terrible about CFM. I suppose, if I had to write something it would be the lack of SEO (search engine optimization) training, keyword research and developing long-term (and free) web traffic sources. No, it’s not. My biggest issue with Chris Farrell Membership is that it’s lacking a few things. But there is some really great stuff as well, and it’s an honest program. CFM is one of my top recommendations. For those who only use their computer to surf the web, and maybe type up a document every once in awhile… Chris’ program is a good place to start. And I wouldn’t be doing this review justice without talking about what a good teacher Chris is. Except for the rare exception, all of the training and content offered here comes at you through video. And the videos are really good. Chris has a background in radio, and he is easy to listen to. Add to that his outgoing personality, infectious enthusiasm as well the James Bond British accent and you get a killer combination. I was never bored, even after many hours of videos. He goes into great detail, doesn’t rush, and puts the proper emphasis in the right places. More importantly though, is that Chris doesn’t hide behind his business. He puts his name on it. This is not just evident in the course name, but he’s the guy walking you through all of (well, most of) the training every step of the way. This is a big deal because he’s personally invested in it. You’re not getting a generic program here (unlike some systems where the owner(s) are completely absent except for a few symbolic emails). This is probably the biggest reason that I’d recommend Chris Farrell Membership. Chris is also genuine. As mentioned, he shares his personal journal covering his first 11 months online and his journey was no walk in the park. Your’s probably won’t be either (nor has mine). Also, he doesn’t mess around with a complicated cancellation process. It’s right there in the drop-down menu, and just a click away. I know this Chris Farrell Membership review is long, but if you’re here to learn more about it, I’ll be getting into more specific details below. It all begins with a series of videos called 10-Minutes to Success. It’s a little misleading, however. The 10 minutes refers to the average length of each video, and there are 31 videos, one for each day. So… one could say 10 minutes a day, for 31 days (give or take). But, it doesn’t really matter what it’s called. It’s an absolutely fantastic way to begin your online career… assuming you don’t already have one. I’ve mentioned already that the simplicity might undermine the entire process. Beginners could be in for a real shock once they get through the initial stages and find out they’ll need to dedicate some serious time to their business. This, however, does not negate the quality and effectiveness of the training you’ll find here. As someone who started out researching and figuring out a lot of this stuff on my own, I can’t overstate the value that is being offered in 10-Minutes to Success. While in theory, it’s a 31-day course… if you start out early and dedicate a full day to it you should be able to complete it. I followed along step-by-step (even purchasing a new domain and pointing it to my current host) and it took me about 4-5 hours. I’m not new to any of it though. So someone starting out, even if it took you twice as long, you could get through it in a day. And, in that single day, you’d be further ahead than many beginners get to in weeks or even months. Other than a domain name and host, I refused to spend a dime when I started. I spent a lot of time figuring it out on my own… researching everything I could find online. I did get my site up and running but as I learned more, it became clear I had taken it in the wrong direction. Although I had my site, I just didn’t know what I was doing with it. As I went through Chris’ video’s one by one, following every step, I couldn’t help thinking how much time this would have saved me starting out. Not that I regret learning everything I did the hard way, but if your goal is to learn how to make money online… the hard way isn’t exactly efficient. Once you’ve completed 10-Minutes to Success, you can move on into the Specific Skills area, or the I Love Traffic section. This is where the real work begins, and as a member you will get some great training here. However, it’s not as in-depth as I’d like. To be fair, just about everything there… from generating traffic to learning WordPress could be $37/month for a comprehensive course on its own. You’re getting a solid introduction, and an understanding of the basics here at no additional cost. In addition, there is training on how to use other sales funnel tools such as Lead Pages and Aweber. This is where my Chris Farrell Membership review takes a slightly negative turn. I was a little disappointed with the I Love Traffic Section. I was so impressed with the 10-Minutes to Success series, that I was expecting to be blown away by the traffic tutorials. Unfortunately, they were a big let down. Three videos in… plus an intro (so 4 videos) and there was still no actual instruction on generating traffic. Traffic is the elusive white whale of affiliate marketing (or any online business) and you’re not going to find anything special here. The main method of generating traffic is taught by utilizing Facebook. But, some of it is a little out of date. For example, there was a time when comments you made on Facebook Pages you followed would also show up in your friend’s newsfeed (even though they did not follow those pages). I’m not certain if Facebook has changed, but I don’t see those type of irrelevant comments anymore. However, some of the training assumes that if someone comments on your post, that person’s friends will also see it (and so on) therefore multiplying the number of eyeballs to your promotion. I don’t think that’s happening anymore. You will also find some valuable information on paid Facebook advertising, although it’s limited as well. What bothered me the most, is that there was no real information on what is arguably the most relevant and important tool for traffic… SEO (Search Engine Optimization) and keyword research strategy. There is some stuff on video and forum marketing, as well as guest blogging, but nothing on SEO. I touched on this above, but the reason CFM doesn’t teach this is because Chris’ training relies solely on sales funnels (landing (or squeeze) pages and email lists). Keyword research and search engine traffic just don’t factor into this strategy. So, why teach it… right? While search engine traffic is not the be-all and end-all of online marketing, it’s crucial to your efforts because it converts better than other sources. People who find you through a Google search for example, chose you. They are looking specifically for the information you are providing. This type of traffic shouldn’t be ignored. This type of traffic should not be ignored. It also requires that you have your own “home” on the internet, a niche or authority website… which is also absent from Chris’ training. An authority website (or blog) that is optimized for search can provide years of free (and highly targeted) traffic. While it takes longer to build, it’s the crown jewel of online marketing. Unfortunately, because people want results NOW, most “make-money-online programs” don’t go through the effort of teaching this long-term strategy. Having said that, landing pages and email lists are an important component as well, but there is more involved in building a sustainable business and that “other stuff” isn’t found here. I’ll say it again, there’s nothing wrong with what Chris Farrell teaches. Clearly, a lot of hard work went into it his program, and it’s some of the best instruction I’ve seen. As an overall program, however, it’s incomplete. It’s the difference between taking a single course at school, while some other programs offer a University degree. There is a members forum, which has a decent amount of recent activity. I can’t say that Chris comments much in the forums, but just because I didn’t see him doesn’t mean he’s not there. There are thousands of threads and of course, I haven’t read through them all. I had to contact support once. The response I received was from Jeff… who is also very active in the forums. So there is an authority presence there which is nice to see. Having said that, when I read through some of the comments below the support page there are people complaining that they never received a response to their questions. There are also people saying positive things… but at best it sounds like response times (or getting a response at all) are inconsistent. And speaking of the comments below the page, I was disappointed to see that most people who commented with a question, never did receive an answer. Every so often another member might respond, but I didn’t see Chris there at all, even when the questions were addressed specifically to him. They offer 3 ways to get help. At the end of the day, the community and support at CFM is not the worst I’ve seen. But it’s definitely not the best either. From what I understand, Chris used to offer hosting to members but that’s no longer available. So, in addition to your membership fees, you will also have to pay for domain names and a host. For this type of marketing to work (sales funnels), you will need an email autoresponder account. And, while CFM does include some simple software to build landing pages you will eventually need something more advanced like Lead Pages. All of that (depending on your subscription levels) will be in the $50 – $100 per month range. The big expense with sales funnels, however, is paid advertising which could add up to thousands if your Ads don’t convert well. To be fair, as far as starting your own business goes, these are small expenses compared to what you’d spend on a typical bricks and mortar business. Either way, running a successful business costs money. An online affiliate business is exceptionally cheap compared to just about every other business, but it’s important to know up front that eventually, you will have some expenses. For a monthly membership of 37 bucks, you can’t really go wrong here. Even those with some experience will likely pick up a thing or two. I do wish this was a more complete program, especially because Chris is a sincere and likeable guy. He’s clearly put a lot of work into this, and a lot of people stuck in a life they’re unhappy with could really use it. If you’re on the fence about whether or not to try CFM, there’s nothing to worry about. Of course, I don’t know your financial situation, and I don’t want to suggest the cost is irrelevant. But, you are getting an honest product for that price and you will learn the process of making an income online. In addition, Chris has made the cancellation procedure simple so you’re not going to get locked into something you can’t get out of. I hope this Chris Farrell Membership review gives you the insight you were looking for. Please comment below and share your thoughts… especially if you’re a member or have tried CFM. It would be great to hear your opinion. 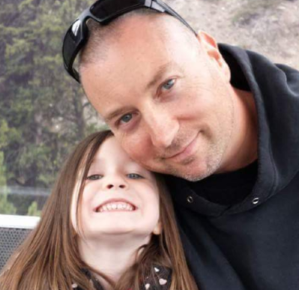 Check out Chris Farrell’s Membership HERE or my TOP 5 RECOMMENDED online marketing products.